Throw everything into a food processor and blend on medium speed for a couple of minutes, periodically scraping down the bowl. Preheat your waffle iron, spritz it with non-stick spray (both sides), then pour in the batter, filling the chamber only about 2/3 full. Don’t overfill! This batter spreads and rises a LOT, much more than regular waffle batter. The first time I made it, I had batter spilling out the sides. Cook until the indicator light comes back on (or however your iron signals that waffles are done; mine took just under 2 minutes). These cook more quickly than regular waffles. If they come apart as you are trying to remove them, close the iron and give them a little more time. You might also find it easier to remove them if you flip the iron over before opening it. 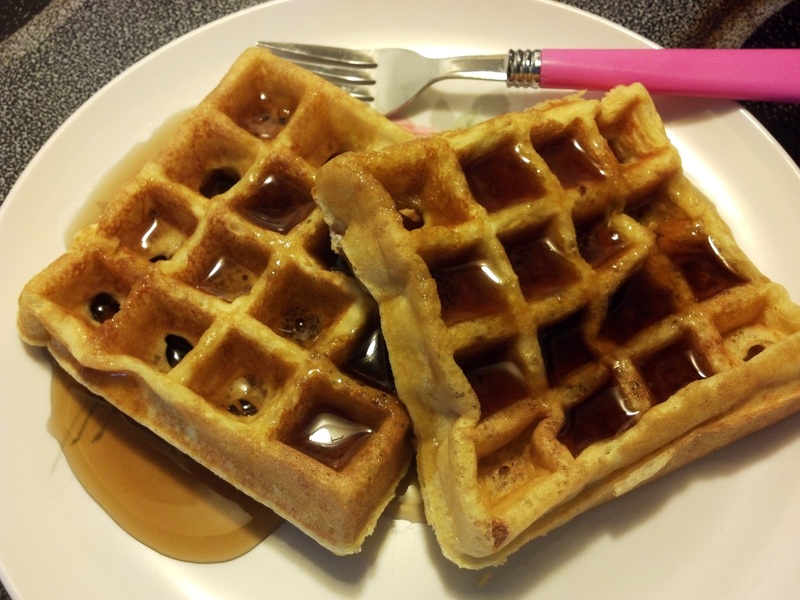 Makes 8-10 Belgian waffle squares. Nutrition information (for 1/8 recipe): 210 calories, 19g fat, 3.4g carbohydrate (including 1.3g fiber, for a net carb count of 2.1), 8.3g protein. Add about 2g carbs if using powdered sweeter (e.g., Splenda). Serve with sugar-free syrup or jam. There are now several brands of syrup to choose from (check the regular syrup aisle and the dietetic aisle). Right now I’m using IHOP’s, which has the lowest sugar-alcohol content I’ve seen (4 grams of isomalt). Smucker’s makes great low-carb jam (5g per tablespoon), and there are others (including cheaper store brands) available. Or top your waffle with strawberries and whipped cream. These waffles are very light and delicate, but if you’re careful, you could use them for making a sandwich. *I buy whole, blanched almonds in “bagged bulk” from my local Natural Grocers (which has the best price I’ve seen), and I grind them up in a coffee grinder as needed (plus I make a couple of extra cups each time, which I store in the refrigerator). Natural Grocers also sells unblanched almond meal (also for a very good price), which is fantastic in this recipe, creating sort of a “whole grain” texture and taste. **I used 15 drops of EZ-Sweetz liquid sucralose. ***I use light salt whenever possible because it provides extra potassium, which low-carbers tend to need more of.